Maximize your living spaces with this versatile writing desk. This desk has a 36" height creating a higher working space. 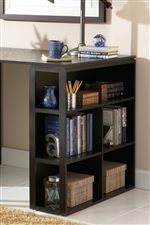 Each end features a storage bookcase to keep books, papers, DVDs, decorative pieces and any other office supplies. You can keep this desk in your living room, den, bedroom or kitchen area, perfect for apartment or loft living. The Bradford Contemporary Writing Desk with Side Shelf Storage by Steve Silver at Walker's Furniture in the Spokane, Kennewick, Tri-Cities, Wenatchee, Coeur D’Alene, Yakima, Walla Walla, Umatilla, Moses Lake area. Product availability may vary. Contact us for the most current availability on this product. Finish Available in a black or dark oak finish. The Bradford collection is a great option if you are looking for Casual furniture in the Spokane, Kennewick, Tri-Cities, Wenatchee, Coeur D’Alene, Yakima, Walla Walla, Umatilla, Moses Lake area.